From fundamental movements that keep you gliding on ice to essential techniques which help with stability, learn all you need from Singapore’s only national ice skating programme, SKATESTAR. Specially developed with Singapore Ice Skating Association (SISA) and Singapore Ice Hockey Association (SIHA), this Learn-to-Skate programme aims to develop love of ice skating for people of all ages, and is only available at The Rink. Learn-to-Skate programme aspires to cultivate a solid skating foundation through standardized progressive courses. The programme allows both kids and adults to acquire elementary skills for leisure enjoyment, and progression to a more advanced level for those who aspire to skate competitively. Year-round courses for all skill levels. 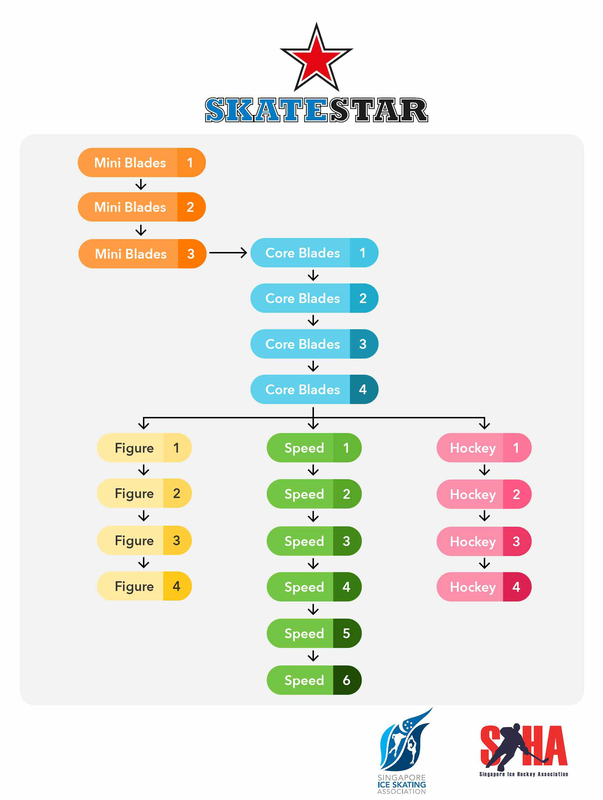 Courses that progress skaters from the Core Blades (Basic) levels to Advanced LTS for Figure Skating, Speed Skating, and Ice Hockey. Classes grouped according to age group and skill level. Controlled instructor to skater ratio for focused teaching. Seasonal intensive courses twice a year during school holidays for the Summer and Winter Camps. CCA for schools at a subsidized rate.